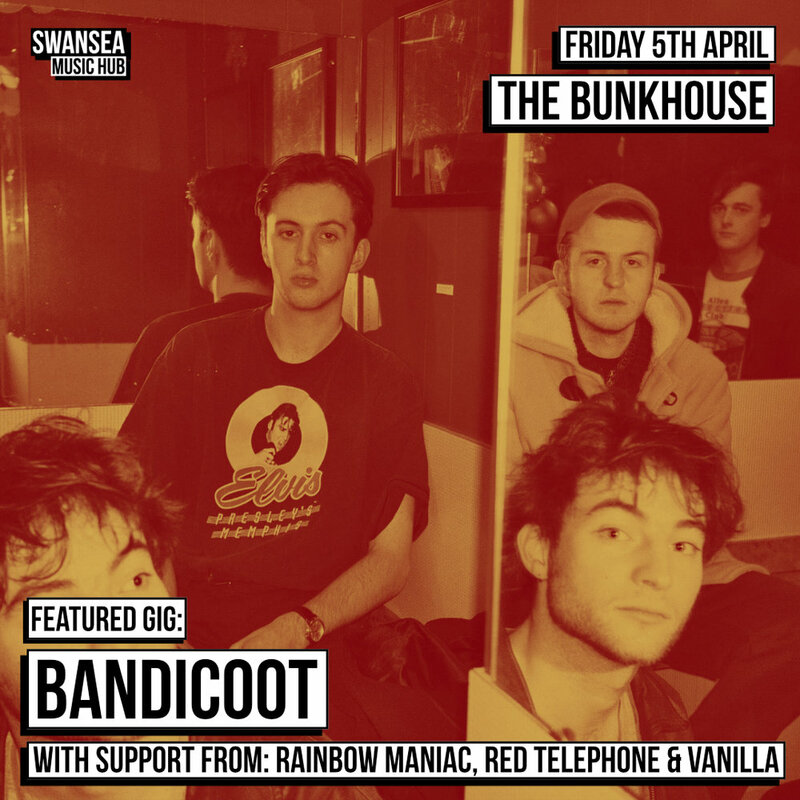 Bandicoot return to The Bunkhouse after THAT ridiculously good sold out show before Christmas and this time, they’re bringing a bunch of their very very talented mates to support in the shape of: Rainbow Maniac, Red Telephone and Vanilla. The band have already had an explosive start to 2019 with shows in Cardiff’s Clwb Ifor Bach (supporting Wooze) and Bristol’s The Fleece (alongside Fossette). On top of that the band have been working super hard with in the studio, with producer Tom Rees (Buzzard Buzzard Buzzard) to record their next single (out very soon). AND on top of that, the band have been awarded with funding through Horizon’s Launchpad fund that they’ll be using to record ANOTHER single later in the year. It’s safe to say that the band are going to have a very very exciting year ahead - why not catch their first Swansea show of the year - it’s bound to be a mental one that you won’t forget! Vanilla, one of our ones to watch for 2019, have just dropped their latest single “On My Way Home”, smashed a headline show at Creature Sound and supported YAK at Clwb Ifor Bach - all within the last 4/5 days! Catch them whilst they’re riding high! Red Telephone have also had a great start to 2019 and are due to have a very exciting year ahead. With one Bunkhouse show already under their belt this year and fresh from Tallinn Music Week (Estonia) - this is one band you don’t want to miss! Another awardee of Horizons’ Launchpad fund, Rainbow Maniac have been tearing it up in Cardiff for the last few years. Coming off the back of some very busy & wild shows in the capital, we’re excited to see Rainbow Maniac bring their heavy indie rock n roll to the Bunkhouse!